Inspired perhaps by the ending that didn’t come last year despite whatever promise we read into Mayan calendar habits, 2013 has been a year for finality, from the apocalyptic narratives dominating pop culture to the tense, imminent conclusions of series like Breaking Bad. 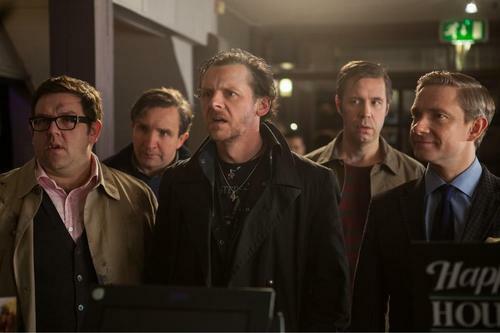 But few works this year merge metaphorical endings with literal ones quite like The World’s End, the long anticipated conclusion to Edgar Wright, Simon Pegg and Nick Frost’s “Cornetto Trilogy,” which began nearly ten years ago with Shaun of the Dead. And even fewer works pull off that merger while also exploring the chief anxieties of Gen X as their teenage years have come en vogue once more, picked up by a newly blank generation. Each installment of the Cornetto Trilogy has occupied a specific genre space, from Shaun of the Dead’s zombie horror to Hot Fuzz’s ’90s bad boy action, and while The World’s End is no different, set as it is around an updated ’50s sci-fi invasion theme, it’s also the most meta. That of course means plenty of nods to the prior installments of the trilogy (the junk food that gives the trilogy its name makes an appearance, as do some familiar faces, slot machines and fence hops) but it also means a more personal meta aspect, with World’s End feeling distinctly more intimate than every prior piece of the series. For Wright, Pegg and Frost, The World’s End is also the end to a very long, hard road they took to get to the position of making and releasing such a personal project and so it’s filled with their own histories, from a soundtrack filled with music they enjoyed when they were the age of the young kids at the start of the story to the anxieties they brought to the characters they created in their series Spaced. 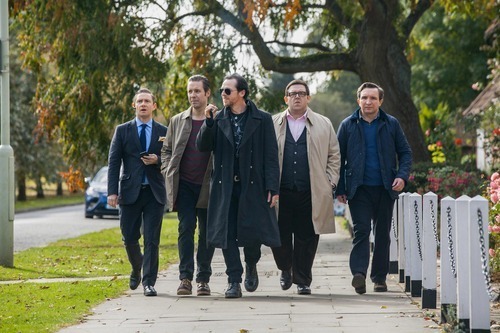 It’s even possible to read into The World’s End as a bizarro version of the lives of these collaborators, where everyone went legit while Pegg wound up the odd man out, still hoping for a break and unwilling to let the good times no longer roll. In this bizarro world, Pegg is Gary King, a strung out loser who we first see in a support group circle, regaling his peers with the tale of his glory days, specifically the day he and his mates attempted to run a pub crawl in their home town, only to call it quits after the 8th of 12 pubs. Wright, as always, is the most creative comedic director working in film today, and this framing device— which has a longer, larger pay off than you might initially suspect— is an immediately interesting touch, more artfully sincere than a comedy montage intro has any right to be. But it also sets up the tone quickly and efficiently, putting King’s squalor into perspective as the introduction of each of his mates, twenty years on, shows they’re all clearly better off without him and not as interested in revisiting that failed pub crawl and, in the process, their adolescence. Peter (Eddie Marsan) works at his father’s Audi dealership and has a beautiful home that Gary clumsily lurks outside of before confronting him directly at the car lot. Oliver (Martin Freeman) appears to be doing well in finance. Steven (Paddy Considine) sold his construction firm a few years ago and now manages a different one. Gary’s former best mate Andy (Frost) has gone partner in a law firm, and is the toughest nut for King to crack thanks to a betrayal and some owed money. But nonetheless, King convinces them all. Trailers have basically ruined the midpoint reveal that the crew’s hometown of Newton Haven has been overrun by “robots who aren’t robots,” alien copies who the gang end up calling blanks after learning more about how they function and what they’re attempting, but that aspect of the plot isn’t meant to be all that surprising anyway. Instead it exists so that Gary’s true greatest fear— being forgotten— can be brought to life as an alien invasion; it’s not that surprising that Gary is somewhat relieved when the blanks’ forgetfulness around him is revealed to be a selective memory weakness. Though some viewers will take issue with Gary’s obsessive need to finish the pub crawl even as the situation grows ever more dire, it fits both Gary’s personality and a running theme of the Cornetto Trilogy, which is an unwillingness to change no matter how clear it is that change is necessary. That manifested in Shaun of the Dead as forced maturity, where the slacker hero has to man up and realize what truly matters to him, while in Hot Fuzz, Pegg and Frost were the agents of change themselves, forced to wake up a sleepy town and put an end to the nefarious plot of the townsfolk to achieve a state of permanent rural stasis. 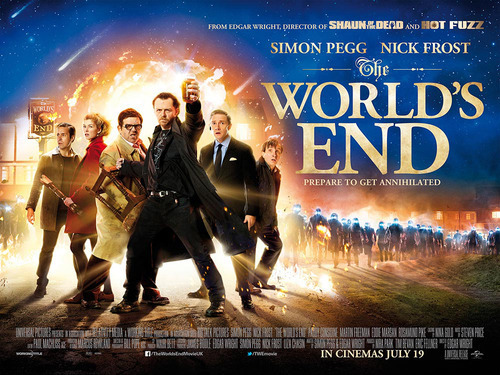 Each portion of the Cornetto Trilogy can feasibly be argued to be the best, but The World’s End makes its case around how well Wright, Pegg and Frost have merged their generation’s doom-laden fear of irrelevance with the millenial fear of an apocalypse of individuality set against a backdrop of actual armageddon. Even as Gary is proven to be right about his fears— and Gary is always right, even when he isn’t— he’s also forced to acknowledge how wrong he is about himself, whether it’s the reintroduction of Oliver’s sister Sam (Rosamund Pike), who Gary had a quickie with in the “disableds” toilet during that fateful first pub crawl that he fails to revisit on this second incarnation, or the gradual reveal of what finally made Andy give up on him. Unlike This is the End, which showed how a group of friends could fall apart because of how little they understand one another, The World’s End details how a group of friends can understand one another perfectly and fall apart because of how little the friend that connects them understands the nature of friendship itself. This is also where the Gen X/Y fears merge with the millenial ones, as we’ve all become nostalgic for a time where friendship meant actual shared experiences and wasn’t maintained over networks. It’s not coincidental that the alien threat in the film is called The Network, and it’s easy to see why Gary’s fear of irrelevance and a swiftly changing society would manifest itself digitally. A man with a cheap, ancient Nokia phone that is definitely not of the “smart” variety, Gary remembers everything about his friends as they were decades ago, but knows nothing about what’s going on with them now. He’s seemingly off the grid and fine with that and even though it irritates his mates, it’s ultimately through Gary and his unwillingness to change that they have real conversations with one another and deal with deep seated issues that have built over time and could never been solved with a status update. The first interaction with the blanks even comments on this, as Gary desperately tries to reach out to and understand a robotic youth who winds up being even more robotic than he first assumed. The film’s coda deals directly with this nostalgia that has been steadily rising, of a desire for a non-digital time when things happened a little more slowly but felt more authentic, and it’s perhaps the strongest moment in the entire trilogy because it’s then that the final message is made completely clear: maybe endings aren’t such a bad thing after all. Morgan Davis sells bootleg queso on the streets of Austin in order to fund Loser City. When he isn’t doing that, he plays drums for Stickers and makes fun songs about horrible subjects with a Chinese opera vocalist as Pontypool.